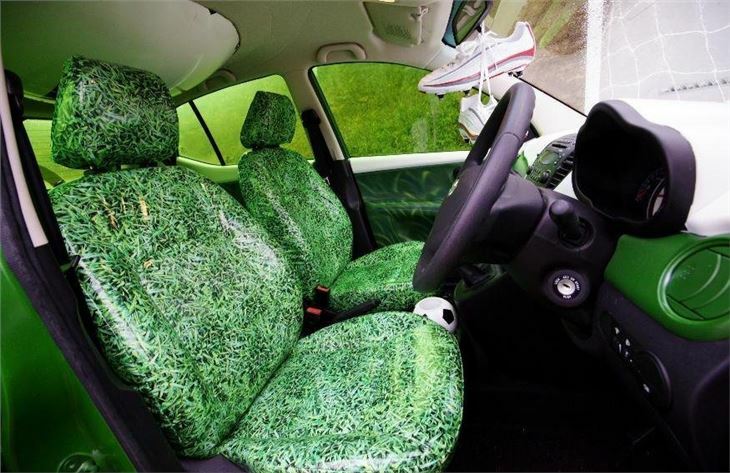 A one-off i10 that was used for publicity during the World Cup has sold for £5005 on the ebay auction site. The car, based on a standard 09-plate i10 1.2-litre Classic went for around £500 less than a normal i10 from a Hyundai dealer. The list price is £7725 and the winner also got the balance of the five-year/unlimited mileage warranty remains. As reported last week, it was produced by car artist Andy Saunders - a hugely talented and world-famous car modifier. 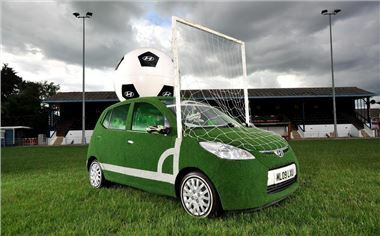 The Hyundai i10 has ‘grass' bodywork and matching interior, a giant football on the roof and goal posts fixed to the A-pillars. In fact, this i10 has had a ‘celebrity' past. Before its conversion the i10 was one of two lent to Jeremy Clarkson for his 2009 DVD ‘Duel'. It's now being sold as part of a charity challenge. All the money raised will be handed to BEN, the automotive industry charity, as a donation.